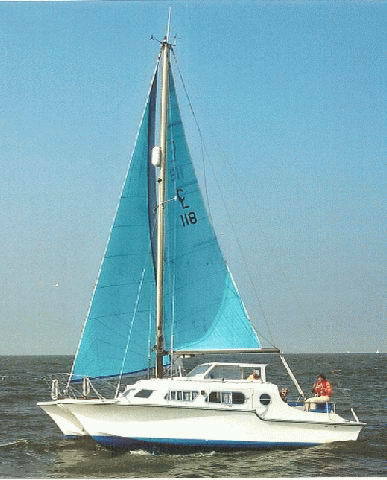 The Catalac 9M was Tom Lack's first venture into catamaran design. 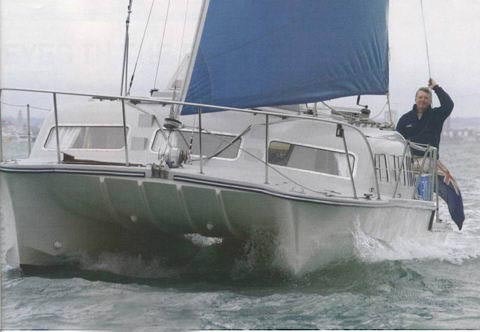 He commissioned John Winterbotham of MG Duff LTD to design the Catalac 9M in 1968, forming part of a range of cruising catamarans which eventually ranged from 8m to 12m. All were built at Lack's yard in Christchurch. This design was envisioned as the successor to Bill O'Briens venerable Bobcat Catamaran. They would be safe cruisers, aimed squarely at the family marketplace. Thought of as motor sailors because of the boxy design, these boats actually sail very well, don't heel while sailing and with the 6' 3 inches of headroom in the hulls, no one feels boxed in or forced to go 'camping'. The Catalac 9M was constructed with solid fiberglass, chined hulls with lots of rocker and deep "V" sections forward which flattened out at the stern. The combination of "V" hulls and rocker, eliminated the need of keels while providing what was thought to be enough grip for windward performance. 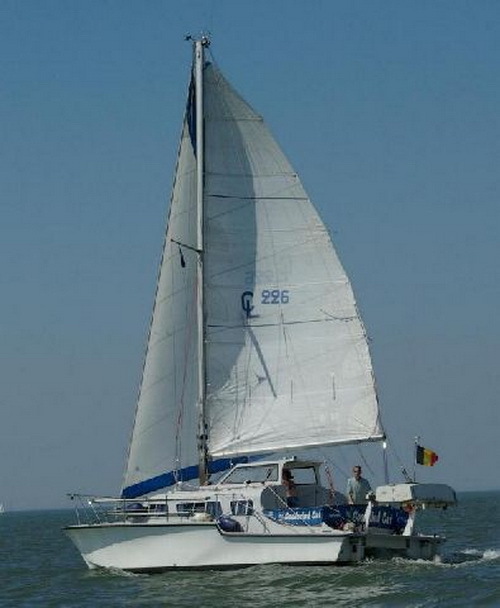 Catalac 9M catamaran under sail. These British built 30 foot boats cross oceans. ed with the outboard engine configuration in a lightly loaded boat. Remarkable performance from such a boxy design given that it's design priority was comfort rather than speed. The mast is cabin stepped in a tabernacle. These were designed be raised and lowered single handed. The standing rigging is over sized to withstand the extra loading experienced by catamarans (the rig doesn't unload because the boats don't heel). 1/4" 1x19 SS on the Catalac 8M and 9M. 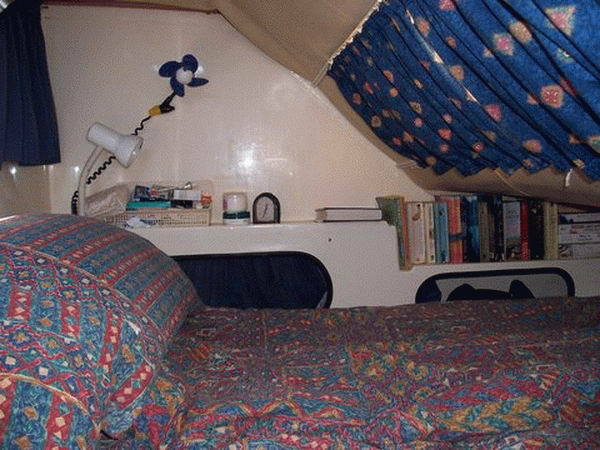 They were sold with a mainsail, working jib and a 170% Genoa. When the rig is set up correctly, they sail with a very balanced helm. Twin rudders contribute to their agility and later models (>1980) have matching skegs just forward of the rudders to increase windward ability. The Catalac 9M was laid out in two versions. The standard layout had rear locker space for a 30-40hp outboard and the optional layout had aft hull space for two diesel engines. 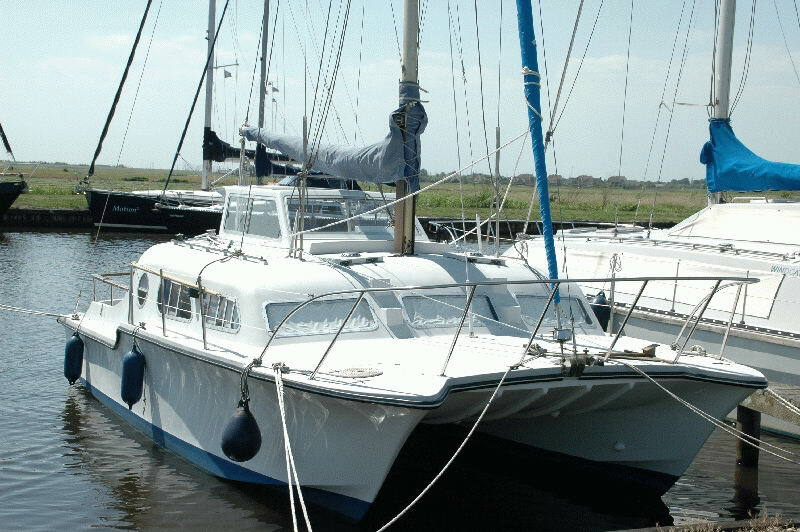 The boats fitted with diesels were well respected for dockside maneuverability as most owners dock with rudders amidship and manuver the boat with the throttles. catamarans are prone to blowing sideways. Unlike a monohull, there's no balast to keep momentum during a tack. 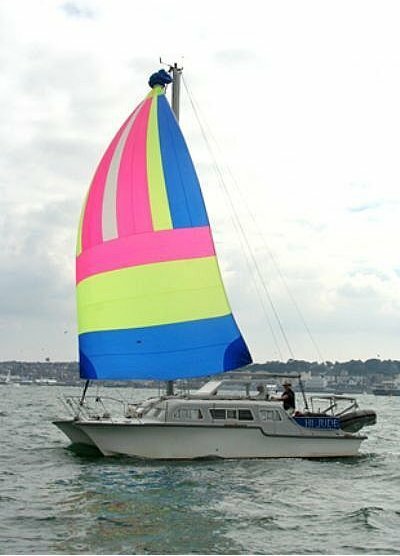 Catalacs require the jib be held until it' about to backwind to turn smoothly through a tack. One has to keep in mind that there are no keels to provide pivot points for the hulls, and it's important to learn that the turning cirde of these boats is greater than one would think. Although sailing is sailing, catamarans sailing requires a bit of learning to sail these boats properly. It's worth it as the Catalac has excellent cockpit space, tons of room below with easy beaching being the prime benefits. Learning to handle a catamaran is a bit of a learning curve, but once the skills are acquired, these boats bring a smile to all who own them. The Catalac 9M was in fact a huge success in the marketplace and 255 boats were built over two decades. They hold their value very well, as does the entire line of Catalac boats. There are never more than a few boats for sale world wide at any given time as their owners have a difficult time finding a larger boat with the same level of quality and performance. Catalac 9M catamaran S/V Kellytime Sailing.